Installatron tool simplifies installation of popular applications like WordPress, Prestashop, Joomla or others. For installation of these applications, check one of our previous guides. In this guide we will show how to customize the branding of the applications you will install with Installatron. For example installed WordPress page would show your as hosting provider’s information at the bottom of the webpage. 1. Log-in to your WHM panel from your service management page. 2. In search field enter “Installatron” and choose the “Installatron Applications Installer” or choose it in the “Plugins” category. Here you can customize Installatron according to your needs and how you want to present it for your customers. 1. You can start from customizing what applications you want to enable for your customers. 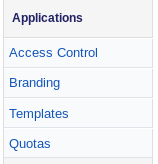 To do so, choose “Access Control” in the “Applications” category. You will see a list of applications. Recommendation here is to choose only the applications requested by your customers or the most popular like “WordPress” and others. Now let’s move further to the “Branding” part of the “Applications” section. Here you can customize the message displayed at the bottom of webpages installed by Installatron. 2. Next, “Interface” section provides the settings for the general appearance and actions of Installatron. In “Branding” part of “Interface” you can adjust the information that will be provided on the Installatron tool. The most important here is the “Installatron Support” setting, where you should enter link to your ticket system or your e-mail address. This is important if there would be any issues with installations. Also you can change the last field of “Web Host Name“, where you should enter your chosen company name. 3. 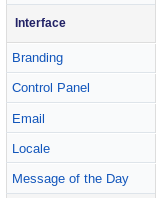 Proceed to the “Email” part of “Interface“. Here you can configure what messages are sent for your customers from Installatron. Important aspect here is that you should set your e-mail from which the messages will be sent to your customers in line “From Address“. If wanted, you will also be able to adjust the default templates for each of the selected actions. 4. These are the main important aspects of Installatron settings where you should adjust the default configurations to re-brand the hosting plan with your information. However apart from the mentioned settings there are other ones that you can look into, to customize the Installatron according to your needs. Take notice that part of the changes done only applies for new installations. So it is best to set these settings before installing any applications.